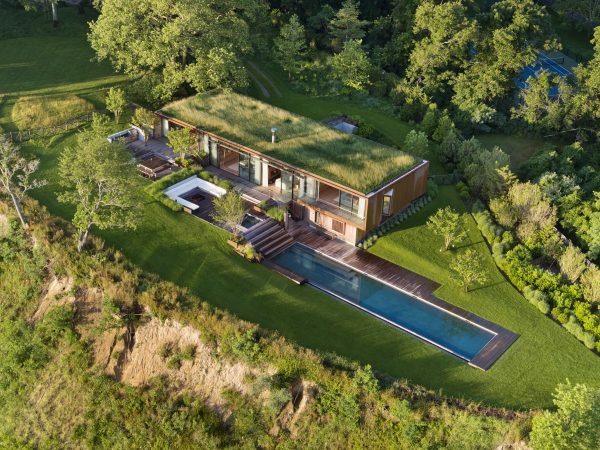 Many of the rich and famous holiday in the Hamptons, New York, and it’s easy to see why. 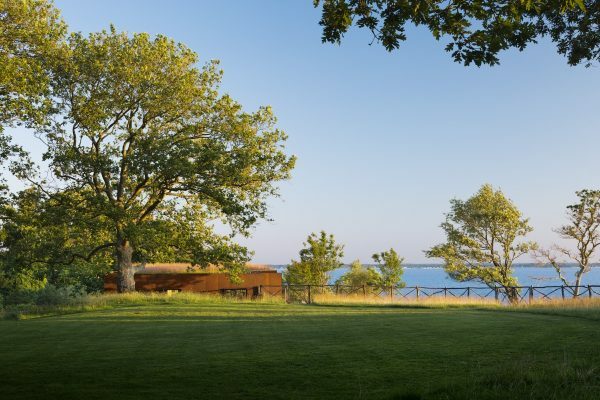 Beautiful scenery and magnificent mansions add up to a playground for the wealthy – places just like this 4000 sq ft family retreat in Hampton Bays, in the town of Southampton. 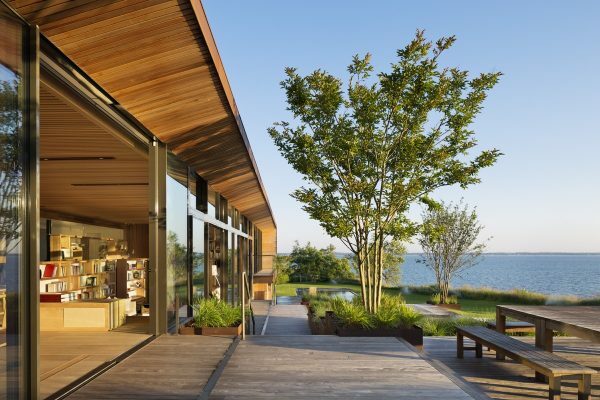 Designed for the founders of a family-owned French global beauty brand, Studio Mapos architects have developed a timeless design that incorporates the latest technology and strategies in sustainable design. 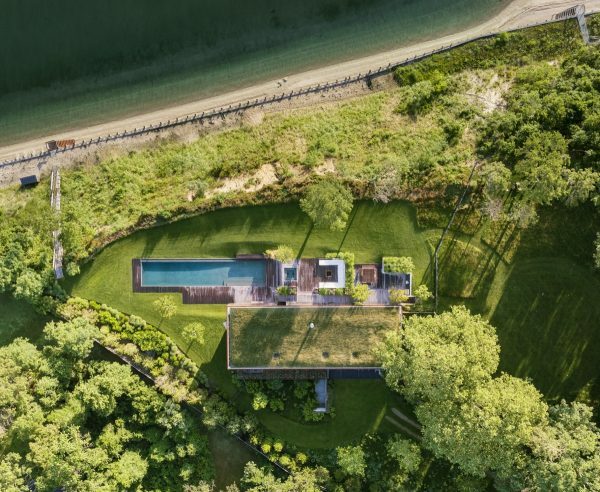 The 5 acre plot is a stunning location that overlooks Peconic Bay, delivering glittering waterfront views to the house. The brief insisted the existing tree arrangement and natural fauna of the site should be protected and respected. 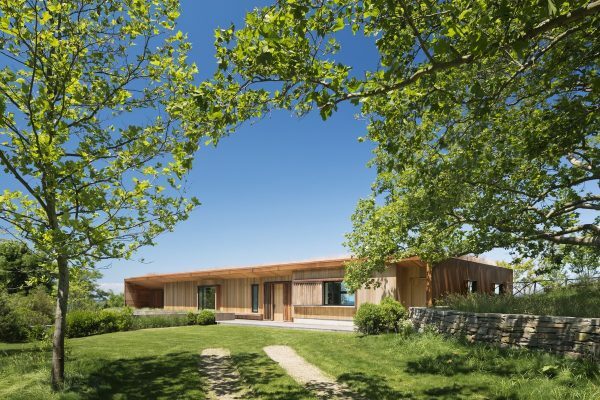 The architectural team strategically placed the build on site in order to preserve an ancient sycamore tree in the meadow, which the family had fallen in love with. The house was dipped low within the landscape and meadow, so that on approaching the house it is possible to actually see over and beyond it. 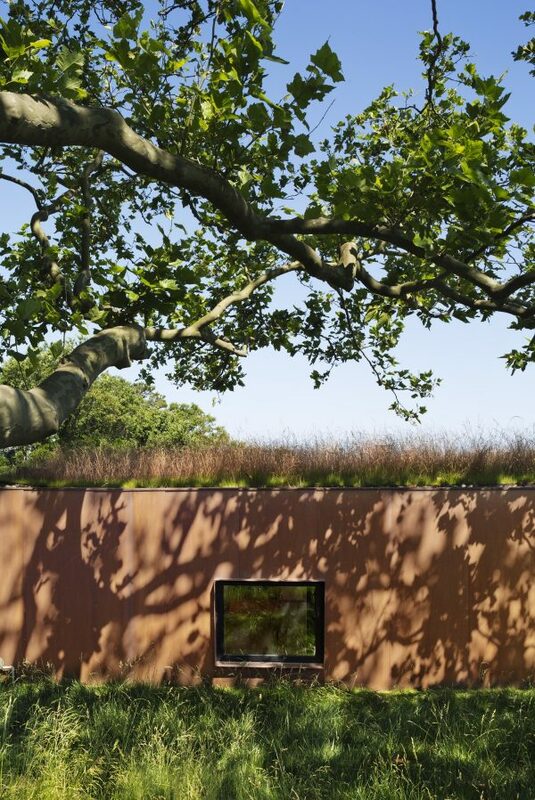 A green roof was included in the design to further meld the modern home with its established natural habitat. 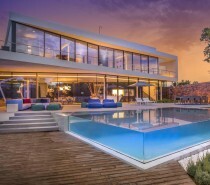 An outdoor swimming pool stretches away from the main house, into lush manicured lawns. 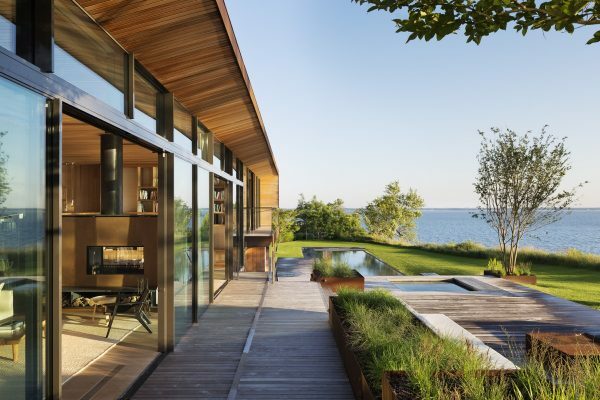 The modern home exterior is predominantly made of glass in order to soak up the breathtaking Hampton Bays view. The architect team had previously completed the company offices for the family-owned business, at their global beauty brand headquarters in New York. 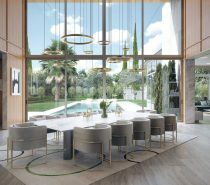 This time, the client challenged the team to create a holiday home that would welcome multi-generational family members. 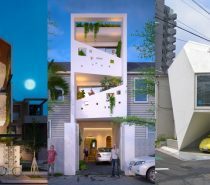 Special care was taken to achieve synergy between the green site and the new home. It was agreed that the home would not have any painted sheetrock surfaces. 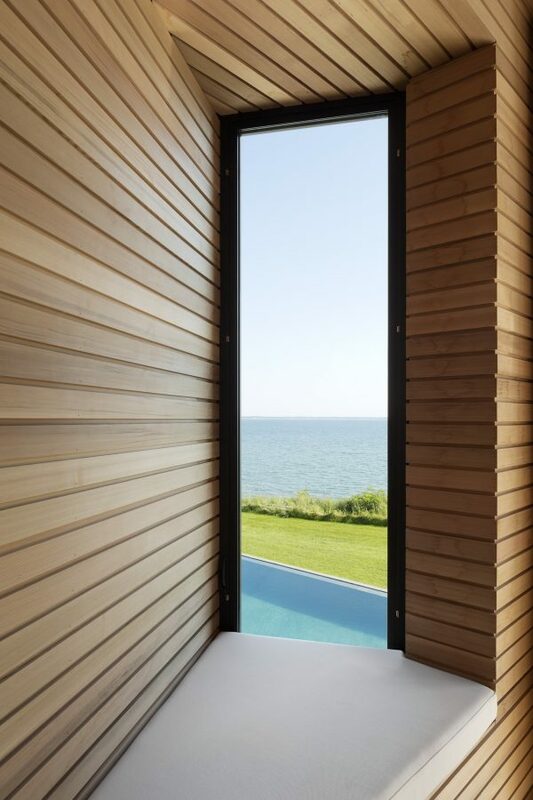 Instead, only raw unfinished materials would be used, so that the look could naturally evolve with age and the salted air of the Hamptons to develop its own unique and beautiful patina. 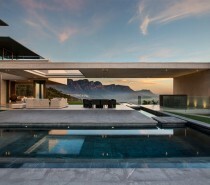 The natural views sweep toward a wooden pool terrace, before washing through a 100 ft long wall of glass. 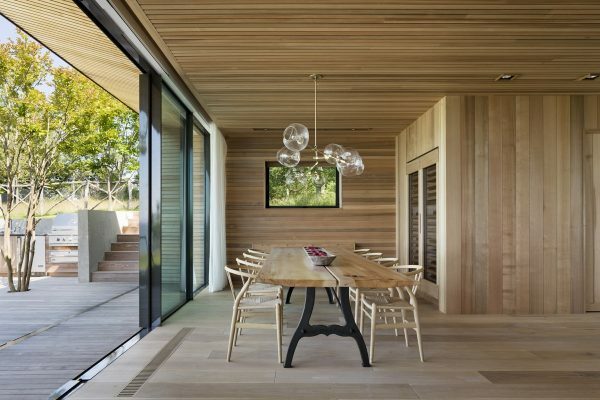 The 4000 sq ft interior is a vision of warm cedar and reclaimed white oak. The interior contains and eclectic mix of curated off the shelf products, alongside fixtures that have been custom designed. Pale fabric sofa upholstery, cream area rugs and white flowing window drapes lighten the look of the wood covered modern living room. 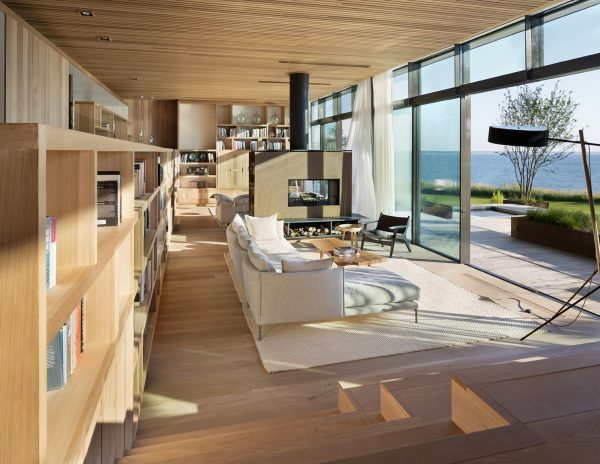 A central fireplace divides the long open plan room into two separate lounge areas. Floor lamps provide reading light by a couch at both ends; the one at this side is the Foscarini Fork floor lamp. The small side table here is the Muuto Around Coffee Table by Thomas Bentzen. The far end of the living room morphs into a kitchen diner at the top of a short staircase. A wooden dining table with Scandinavian style chairs make up a formal dining spot, whilst bar stools provide a more casual dining opportunity. A modern chandelier with glass orb shades is suspended over the eight place dining set. Retractable doors fully open up the dining room onto the sun deck. Having the interior floor at level height with the sun deck joins the indoors and outdoors as one seamless living space. 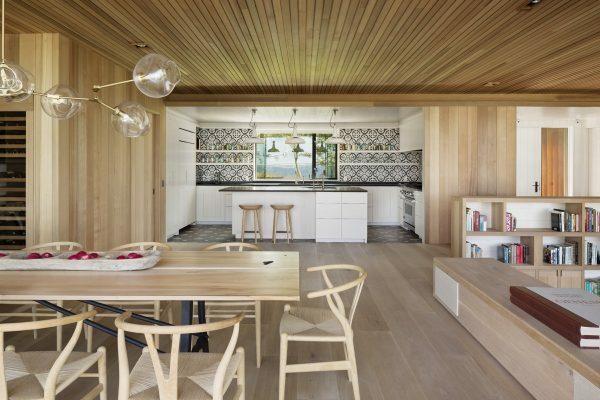 A white L-shaped kitchen with island is tucked away from direct line of sight through the long living room. 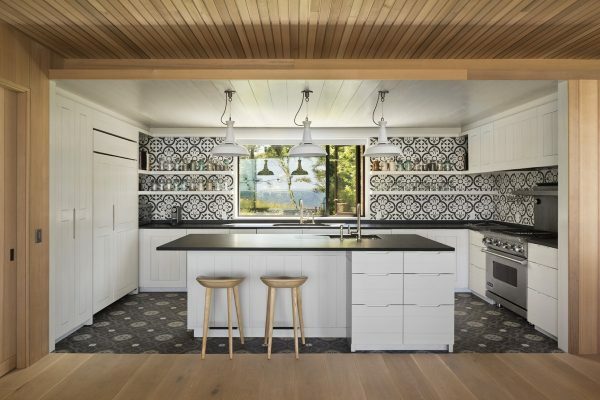 The two wooden kitchen bar stools nestle neatly underneath an overhang of the island’s black countertop, which sits beneath three white kitchen kitchen pendant lights. Bold black and white patterned tiles create an eye-catching effect around the backsplash, with a slightly more subdued pattern underfoot. 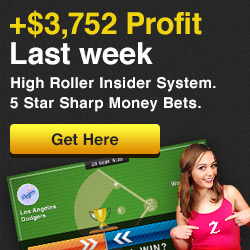 The holiday home also includes a double workspace – a multimillion dollar global beauty brand doesn’t run itself. However, there is also a relaxation area within the home office, in the form of a cosy window seat across a multimillion dollar view. 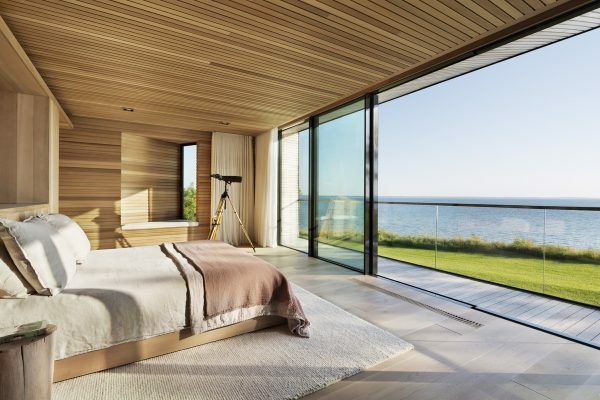 The master bedroom gazes out across the rippling water. The bedroom decor scheme is a calming blend of natural hues. Behind the headboard wall in the master bedroom you will find an ensuite luxury bathroom. A double sink vanity faces the open section of the headboard wall, allowing the homeowners to soak up the dreamy waterfront views as they brush their teeth. 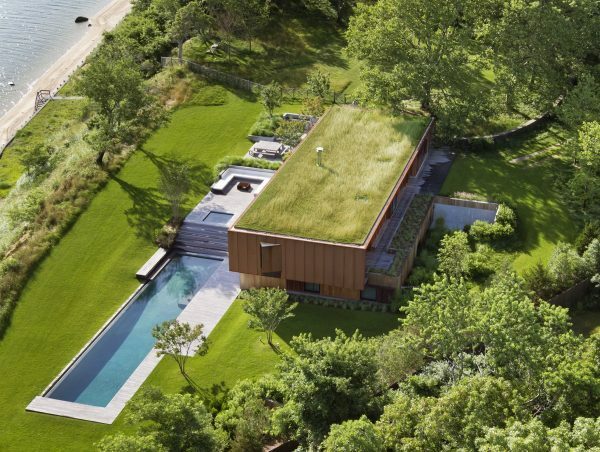 The bathtub stretches out under a view of the surrounding green landscape and mature trees. 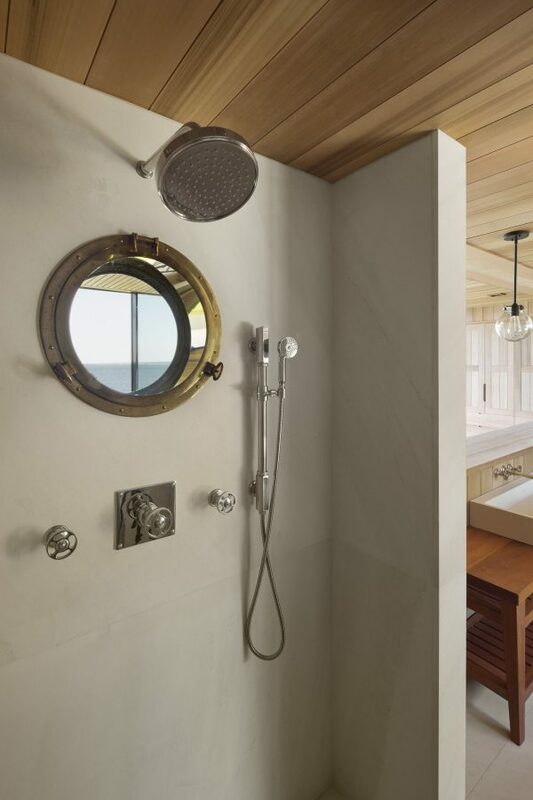 Even the shower cubicle has a view of the waterfront, through an appropriately water themed porthole window. 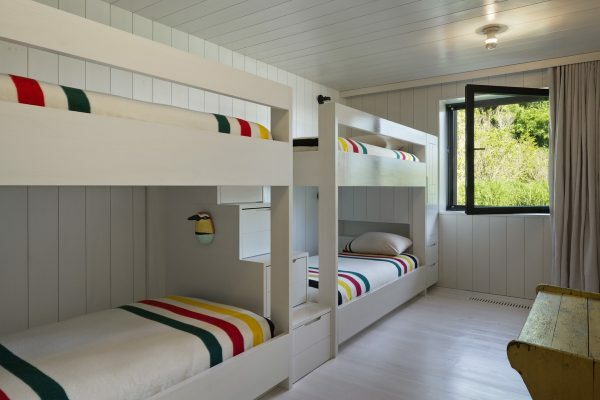 Playfully bright bedclothes dress four kids’ beds in bunk formation. A window nook has been created in the side of the house, which houses a built-in seat in the master bedroom. 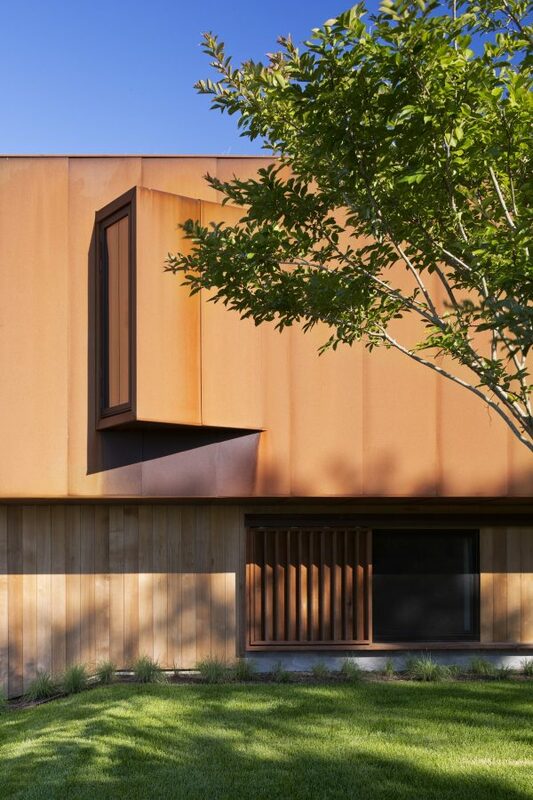 The side window equips the parents with a watchful view all the way to the end of the family swimming pool. 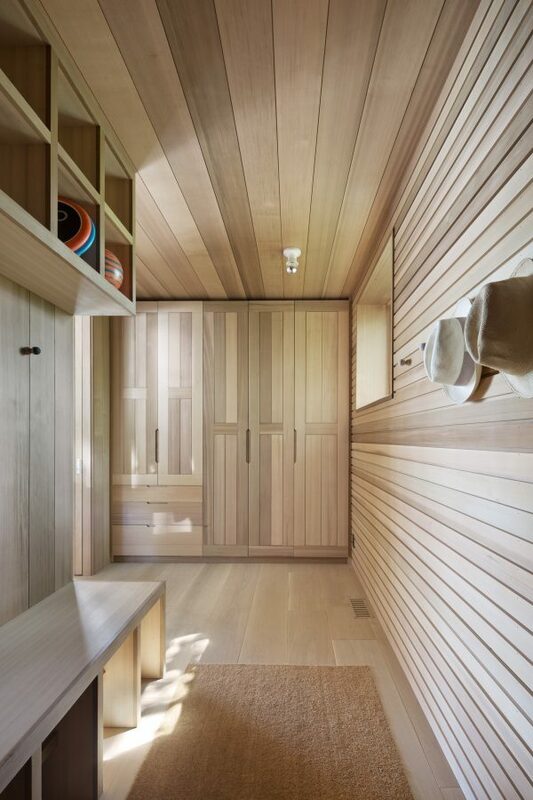 Bespoke storage solutions house all of the family’s vacation items. 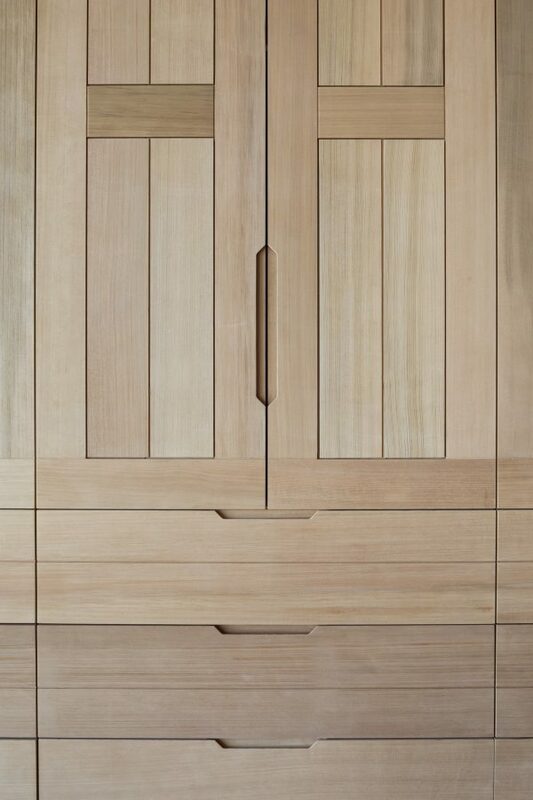 The natural wood finish displays beautifully subtle changes in tone and grain. 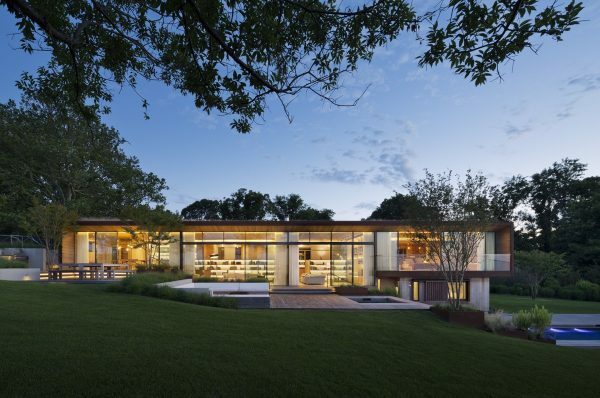 Creating a home design that was respectful of the existing landscape was paramount. The master bedroom window nook forms an angular feature on the side exterior of the house. From some spots in the garden, the 4000 sq ft build is barely visible at all. 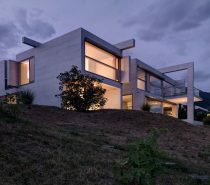 The fascia of the impressive home is unimposing. The architects completed the design and interior of the main house, as well as a guest house. We can see from the plans that the master bedroom is located on the first level with the family room. The remainder of the bedrooms are up on the second level of the home.